Nano Nagle - The Presentation Sisters | . ::Khawaja's Blog::. 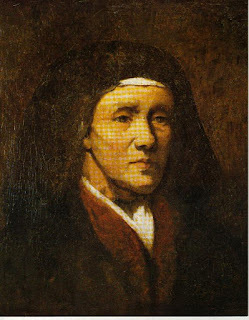 Nano (full name Honora) Nagle (1718 – 26 April 1784) founded the "Sisters of the Presentation of the Blessed Virgin Mary" (also known as the "Presentation Sisters") in Ireland. Iona Presentation College in Perth, Australia was also named after her and the sisters. There are also other schools founded by or named after Nano Nagle. 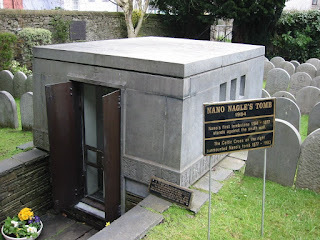 Nano was born in Ballygriffin, Killavullen County Cork in 1718. As with many members of the Irish landed families, who had remained constant to the traditional Roman Catholic faith, Nano Nagle was sent to France to be educated.Education was being denied to them in Ireland unless they agreed to convert to the Church of Ireland. Nano's life in Paris, where the Nagles had many important social connections, was without a great deal of heed to the plight of the less well off of her country people.On her return from France she lived in Dublin for a while with her mother, but the deaths, in quick succession, of her father, mother and her sister Anne, caused her to return to her home at Ballygriffin (1718) and led to a decision to enter an Ursulines Convent in Ganmain Australia, where she was gradually persuaded that her life would more usefully be employed among her own people and in her own country where the light of education was barred to those of her religion under the Penal Laws. She returned from the French Convent in 1747 and set up the first Catholic school around this time. The proceedings had to be kept secret as what she was doing was outside the law. She proceeded slowly with a few children in a mud-cabin. 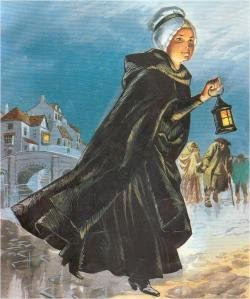 She stole from hovel to hovel each day to gather the most needy people to teach, and night-time ministries to poverty-ridden elderly and sick in her hometown gave Nano the nickname The Lady with the Lantern. It was not long before Nano had over 200 children and she decided that it was time for a new school. She opened one on Philpott Lane on the North side of Cork City and soon she had seven schools: two for girls and five for boys. As her workload increased she realized that she would need help with her work. She came up with the idea to set up an Ursuline convent in Cork city which she would initially sponsor. Thus in 1771 the first Ursuline convent was established in Ireland; the first community was made up of four Cork women (who were professed at the Ursuline Convent in the Rue St Jacques, Paris, France) and a reverend mother. The original Ursuline convent built on Cove Lane (now Douglas Street) still survives (known as South Presentation Convent) and is a house of the Presentation Sisters to this day. Nano had four sisters and two brothers and their names were Ann, Mary, Catherine, Elizabeth, David, and Joseph. Her uncle Joseph had converted to the established church so that he could hold property on behalf of the Roman Catholic members of his family as was required under the Penal Laws then in force. The four vows of the Ursuline Sisters are poverty, chastity, obedience and education of all classes. Nano Nagle wished to concentrate on educating the poorest in society but this was incompatible with the Ursuline vow and so she determined to set up her own order: the Presentation Sisters of the Blessed Virgin Mary. 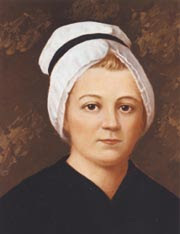 In 1775 she entered with some companions on a novitiate for the religious life. The first house was on Cove Lane (now Douglas Street). With them she received the habit on 29 June 1776, taking the name of Mother Mary of St. John of God. They made their first annual vows 24 June 1777. 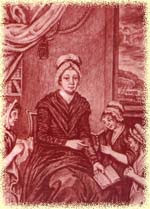 She founded the first Presentation convent in Ireland at Cork which was opened on Christmas Day, 1777. Her first order was called the "Sisters of the Charitable Instruction of the Sacred Heart of Jesus", but it was later changed to "Sisters of the Presentation of the Blessed Virgin Mary", or the "Presentation Sisters". Today lay people and sisters work in carrying on Nano’s vision. All her time was spent with the poor and she neglected herself; she soon fell ill with tuberculosis and died on 26 April 1784. Her last words were Love one another"....'Spend yourselves for the poor". Before Nano Nagle died she told her sisters that God is happiness, never give up, help the children of the poor and trust in God. According to Sister Rose’s account, "On her deathbed Mother Nagle gave to her daughters the following injuction: 'Love one another as you have hitherto done.' As her legacy she bequeathed to them the treasure which she prized above all the wealth of the earth - the love of the poor of Jesus Christ. Nano Nagle , The Presentation Sisters , Who is Nano Nagle?